The Crested Hummingbird. 20 May 1976. Insert: Present. Pictures are of the Cover that you will receive and show them as they are. 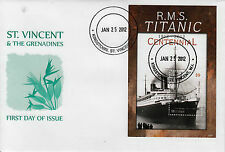 UNUSED COVER WITH 31/1/2006 BEQUIA CANCEL. 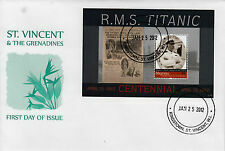 UNUSED COVER WITH 31/1/2006 UNION ISLAND CANCEL. QUEEN 40th WEDDING ANNIVERSARY. St VINCENT GRENDINES. 150th ANNIVERSARY OF QUEEN VICTORIAS ACCESSION TO THE THRONE. 15 OCTOBER 1987. OVER 30 YEARS EXPERIENCE. REST OF WORLD. NO INTEREST | NO CATCHES | NO SMALL PRINT. INTEREST-FREE CREDIT OPTIONS. YOU WILL RECEIVE EXACTLY WHAT YOU SEE ON THE HIGH RESOLUTION E-BAY SCANS. SEE SCANS FOR CONDITION. 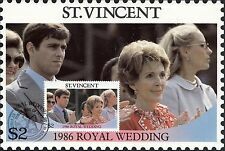 1979 St Vincent First Day Covers x 3 with 20 Stamp Set - .ref175. See scan for further clarification and condition. St VINCENT. Date: 19 JULY 1982. ALL SENDINGS ARE IN FULLY PROTECTED BOARD BACKED ENVELOPES. ANY SHADING IS THE SCANNER NOT THE COVER. 251 - 300 £5.70. 201 - 250 £5.10. 151 - 200 £4.50. 101 - 150 £3.90. 81 - 100 £3.30. 0 - 80 £2.89. Czech Republic (EU) Kosovo Romania (EU). Cyprus (EU) Kazakhstan Portugal (EU). These covers do not have an insert.